Please read the FM Global pilot participation agreement (pdf). By completing the information below, you confirm that you’ve read and agree to be bound by both the FM Global participation agreement and by Buoy’s terms, which can be found under the Legal header at the bottom of this website. Thank you. Please order your Buoy now. Your Buoy will ship within a few days. Standard installation is included with your purchase, so when we confirm Buoy has shipped, we'll also check in with you to schedule a plumber. What is standard? In less than two hours, a plumber will install Buoy on 4-13” of exposed pipe that has at least 6” inches clearance from walls, pipes, and appliances, without needing extra pipe or fittings to do the job. For flex line installations, the plumber will secure Buoy to a 20x20x10 space on the wall that’s less than two feet from Buoy’s connection to your flex line. Buoy will go inside or outside your house in a spot that's always accessible and never submerged in water. Buoy can be installed vertically or horizontally, with either copper pipe or flexline. 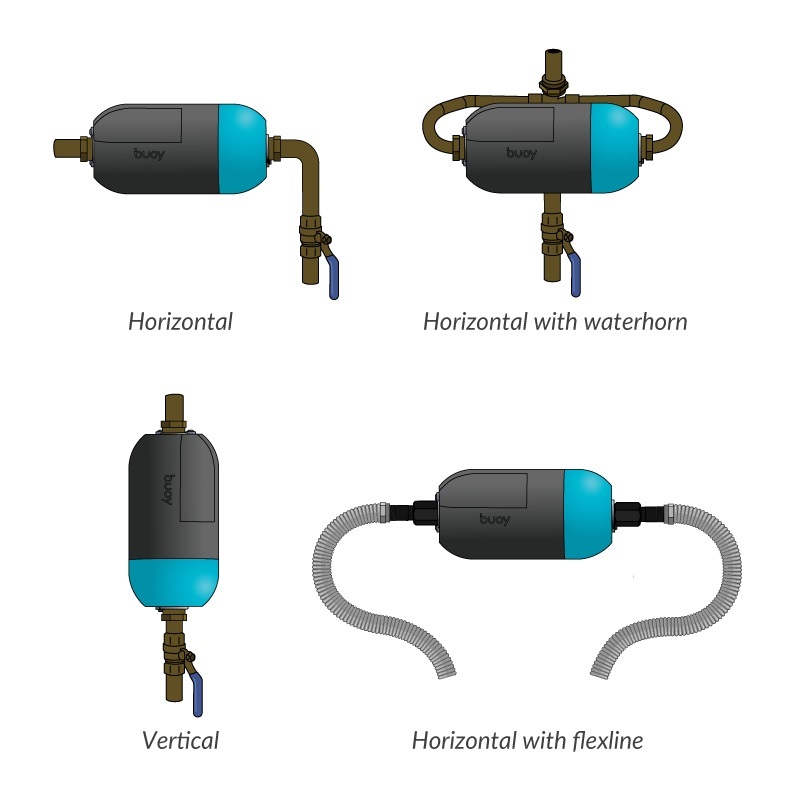 We include the optional waterhorn accessory, which allows installation on only four inches of pipe, so it's available if the plumber needs it. If it isn't used, just contact us for a prepaid shipping label and return it for a refund. The Buoy app is how your Buoy communicates about your water use, and where you turn off your water if there’s a leak.